I like flashlights. They do, after all, illuminate dark places. I especially like a flashlight with a side button because they are much handier to operate as compared to end-button types. 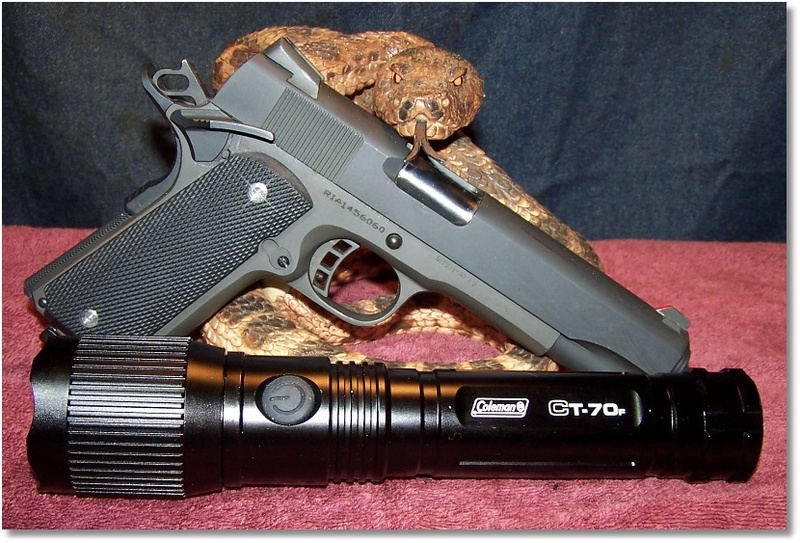 I have used the Coleman CT50 flashlight (500 lumens and also a side-switch controlled flashlight) residing in the bedside stand’s drawer, with a 1911-based pistol, for reacting to bumps in the night. Although the Coleman CT50 flashlight is an excellent product, I ran across a good price on its bigger brother the Coleman CT70F; a product that I am going to bloviate about a bit. The Coleman CT70F is a 700 lumen LED flashlight that is light in weight and heavy in light. With a simply click of the side control switch, you can have 700 lumens at your whim and whimsy to use. The Coleman CT70F operates from six AA cells (Duracell batteries are provided) that load into the rear of the unit in two compartments. If you have ever loaded a double-barreled shotgun, loading the flashlight will not be foreign to you. The unit is constructed of black-anodized aircraft aluminum (a IPX4 water-resistant design) will resist impacts from up to 1 meter. 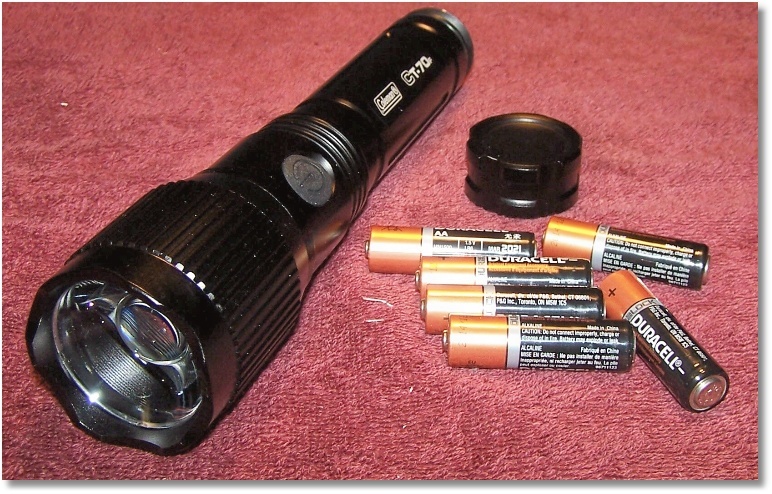 An end-cap (battery compartment) seals the flashlight against the elements. The side-control button, a rubber-covered affair that prevents the elements from getting inside of the unit, also provides a good tactile feel of the switch. The working end of the flashlight is an adjustable head (a focusing bezel, as Coleman calls it) that rotates to adjust the beam width. The adjustable head is nicely serrated to provide a good gripping surface. The Coleman T70F incorporates Press & Hold Electronic Dimming. Press and hold the side control switch, and you can have an automatically-adjusted brilliance of 700 lumens down to 45 lumens and anywhere in between. Simply click the side-control button once and at full beam width and full power up to and beyond 315 meters (1033.46457 feet) of illumination is possible. At low power (45 lumens) up to and beyond 45 meters (147.637795 feet) is possible. Operating time is about 6 hours at 700 lumens and 50 hours at 45 lumens. The Coleman CT70F comes with a Lifetime LED that never needs replacing and a 3-year limited warranty. What is the reason that I prefer side-switch flashlights over end-switch types? I’m glad that you asked. The thumb is not the strongest digit of the hand or the fastest to use. 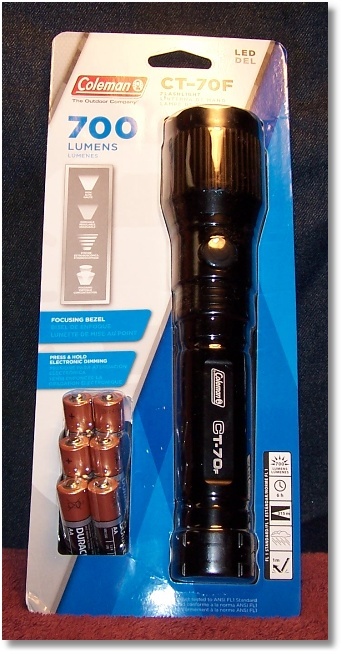 A flashlight of any length is cumbersome when held at the rear in order to activate the thumb switch. 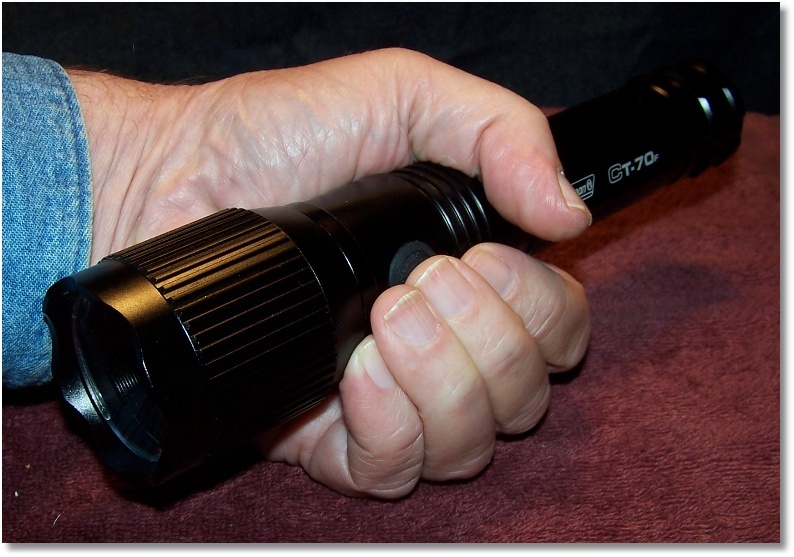 The side-switch flashlight allows a full grip with all digits and the middle finger can work very quickly. I have been trained in the use of side-switch flashlight when handling a handgun. Some like to mount a flashlight on their handgun, but I prefer not to. I would rather have the freedom of positioning the flashlight to my advantage and not provide a target, mounted on my firearm, for the bad guy to shoot at. I also do not wish to fumble around the trigger area of my handgun while trying to find the on-off switch on the flashlight. Granted that there are flashlight and laser devices that operate with a pressure switch, but I will be under enough pressure without having to worry about pressure switches. My preference is a flashlight that has a side-switch control, but your preferences may differ. The Coleman CT70F is a lightweight flashlight that is capable of lighting up the night or a bad guy. It is balances well in the hand without being too short or too long. While not being heavy, it is suitable as an impact weapon. The focusing bezel is contoured such to protect the lens from damage but would also leave some serious and impressive marks on the forehead of some bad guy. The Coleman CT70F has now replaced the Coleman CT50 as the “go to” flashlight for HD use.